Adding a thick layer of mulch to your landscape not only enhances its beauty, but it also has a number of other positive benefits. 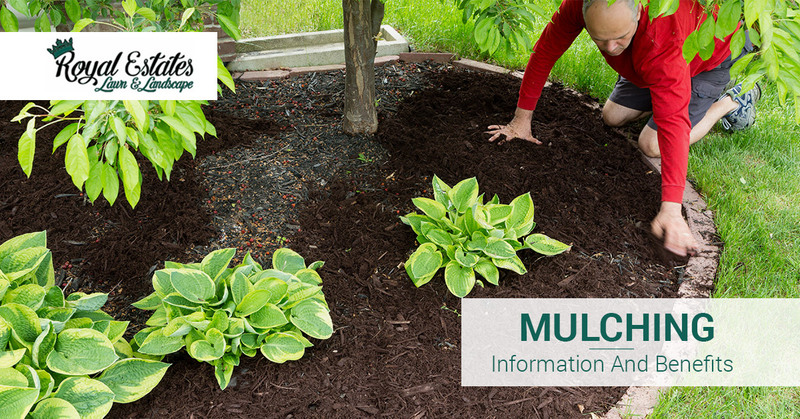 As leading providers of mulching services in the Ascension Parish area, we at Royal Estates Lawn & Landscape would like to share with you some information regarding mulching. If you are in need of mulching services, do not hesitate to contact us with any questions or to get your free quote. We also offer other lawn care services like lawn mowing, pruning, landscape maintenance, and more! As we mentioned, mulching not only has aesthetic benefits. It also benefits the soil and plants in a number of ways. Although there a number of benefits to mulching, in today’s blog, we are going to just focus on six. Plants, of course, need moisture to survive. Mulch—especially organic mulch—absorbs water and the retains the moisture by covering the soil and preventing evaporation. This moisture-retaining blanket is especially helpful when the weather heats up and dries up. This can not only help your plants thrive, but it can also reduce your water bill. Adding a layer of mulch to your garden bed or landscape can drastically help limit the amount of weeds that spring up. This is because the mulch functions as a barrier that keeps sunlight from reaching weeds. Also, when you keep weeds out, you help reduce the competition among roots, allowing for more growth for your plants. Just as a blanket of mulch keeps water trapped in the soil, it also keeps the rain from picking up the soil and carrying it away. Specifically, when rainwater hits mulch, its force is weakened and, therefore, the impact of the rain is lessened. Over time, this can be greatly helpful to keep the soil in place and help prevent slow erosion from happening. A layer of mulch is a great insulator for soil. It keeps the soil temperature more constant. When applied in the spring or early summer, you can keep your soil cooler for longer. Similarly, because mulch absorbs the brunt of the sun’s rays, when temperatures drop in the fall the mulch helps the soil retain heat, thereby allowing plants to grow longer. If you are using organic mulch materials like wood chips and leaves, these materials will break down over time, adding rich nutrients to the soil. Naturally, these nutrients seep into the soil and feed the plants in the area. Not only do the plants benefit from nutrient-rich materials but so does the soil. Specifically, the structure of the soil improves because space is created between particles in the soil. This addition of space helps streamline the process for supplying roots with water, oxygen, and nutrients. Although not all mulches deter pests, some do. For example, mulches with cedar bark have natural oils that function as an insect repellent. As a general rule, the more fragrant the mulch is the greater likelihood that it will act as a repellent. It is also important to mention that some mulches can actually attract insects. If you are curious about what types of mulches will help ward off pests, talk to your local lawn care professionals. If you are attempting to mulch your own planting beds or newly planted tree, be sure to remember these tips. Avoid applying mulch against tree bases, structures, buildings, and fences. As you can see, mulching when done correctly can have a number of great benefits. If you are unsure about what type of mulch to choose or where to mulch, contact Royal Estates Lawn & Landscape! Whether your home or commercial space needs mulching, lawn care, landscaping, or some other related service, we are poised to handle it. Learn more about us, our lawn services, and contact us today to schedule your appointment or to get your free quote.